A year after the war with Georgia, South Ossetia is slowly rebuilding itself amid fears of new aggression from Tbilisi. 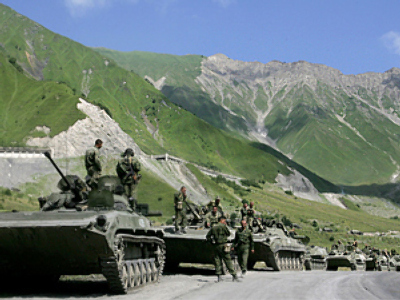 To start large-scale construction work, South Ossetia needed to secure its borders from future attacks. With Russian peacekeepers in the republic security was not an issue. However, in order to maintain a prolonged presence of Russian troops, the two countries needed a new cooperation framework, which was found in May when a five-year agreement delegating border protection to Russian troops was signed. Earlier the construction got another boost when the gas supply to South Ossetia was resumed in late January, solving the key problem of energy supply. Though the gas itself essentially comes from Russia, due to pipeline constrains its only route to South Ossetia is through Georgia, which turned it off in August 2008, just when their conflict erupted. Despite putting the blame on a technical malfunction, the Georgian side repeatedly refused to allow Gazprom to help deal with the malfunction. In the end it took half a year for them to take care of the problem on their own. In a similar situation with South Ossetia’s electricity supply, which comes from the neighboring Russian region of North Ossetia, the technical malfunction was resolved in just a day. Altogether this helped South Ossetian authorities start rebuilding private residences. In July the head of the biggest construction contractor, Robert Bibilov, announced that building had already begun. Still, there is a long way to go. According to estimates, in Tskhinval along nearly 70% of the buildings were either destroyed or severely damaged during the August fighting. Despite this and other problems, like the absence of a large-scale water supply to Tskhinval that authorities vow will soon be restarted, refugees are already returning in scores to the republic. As South Ossetia’s ombudsman David Sanakoev claimed in January, many of those who left the republic in the 1990s are coming back. One of the reasons behind this was the ill treatment that refugees from South Ossetia received in Georgia. But that alone doesn't explain the overall scent of revival that is evident in the region. As South Ossetians look for new potential areas of business, like agriculture, winemaking, mineral water production, eco-tourism and mountain skiing, a spotlight has been shone on infrastructure restoration. To master this massive revival wave and manage complicated tasks, mostly in construction, Vadim Brovtsev, 40, was appointed prime minister this Wednesday. Brovtsev, a Russian, used to be the board chairman of the Vernikulit construction company from Chelyabinsk. His main objective at this point is to finish the private houses by winter. As for the larger picture, some experts see the roots of Brovtsev’s appointment in Moscow’s dissatisfaction with the pace of restoration work in South Ossetia. This dissatisfaction became evident during Russian President Dmitry Medvedev’s visit to Tskhinval in July. Russia disbursed around $50 million to South Ossetia in 2008, and added another $350 million in 2009. The head of the Civil Initiative Fund and ex-prime minister of South Ossetia, Oleg Teziyev, was quoted by Vedomosti newspaper as saying that “naturally, Russia needs control”. “The new prime minister will stay close to Kokoity to ensure that something is being built,” Teziyev told the daily. Just days after the bombardment of Tskhinval, Valery Gergiev, a renowned conductor of Ossetian origin and principal conductor of the London Symphony Orchestra, performed a concert in the Ossetian capital. The concert featured selections from two Pyotr Tchaikovsky’s symphonies and a part of Dmitry Shostakovich’s Sixth. The famous “Invasion Theme,” which Shostakovich composed in Leningrad under Nazi siege, stressed the determination of Ossetian people to overcome the hardships, taking inspiration from the age-old Ossetian and Russian culture. Bullet-riddled works of art from a South Ossetian art gallery, damaged by Georgian forces during the Five-Day War, formed an exhibition that visited seven Russian major cities. June 2009 saw a youth festival in Tskhinval called "Apple of Narts," a reference to the ancient legend of a magic apple tree grown by Narts – the forefathers of today’s Ossetians – the fruits of which gave perennial youth to those who ate them. 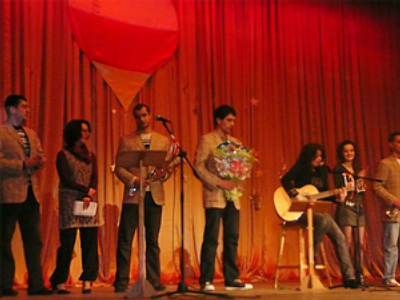 The festival featured children from the UK, the US, Bulgaria, Serbia, Israel, Lithuania, Ukraine and various parts of Russia, as well as Abkhazia and Transdniester. Even Russian bikers will get their very own warm reception in South Ossetian capital. On August 7 they will start a 6,000-kilometer drive to Tskhinval. Meanwhile, Georgia does everything it can to try and hamper the development of the newly-independent republics. First in March Tbilisi positioned itself as an alternative source of aid for South Ossetia. Commenting on the Moscow administration’s promise to send financial aid, the vice speaker of Georgia’s Parliament, Mikhail Machavariani, told Ekho Moskvy radio station that his country had substantially more money, around $4 billion, to give South Ossetia. But Georgian “aid” came with a pricetag: Russia had to pull out all of its troops from the republic, rendering it defenseless. The offer was immediately dubbed as cynical by South Ossetia’s ambassador in Moscow, Dmitry Medoev. He said the region would never accept the money if it meant sacrificing freedom and independence. Later in May, Georgian authorities protested against Benetton opening a store in Abkhazia. Tbilisi claimed that to operate a store on what it regards an occupied territory, Benetton has to pay taxes to Georgian authorities. Facing the prospect of paying double taxes and not willing to endanger its four stores in Tbilisi, Benetton refrained from going to Abkhazia. As time goes by, certain peculiarities of Five-Day War media coverage are becoming known to public. Polish state TVP (Telewizja Polska) correspondent Voctor Bater, who condemned the Georgian bombardment of Tskhinval as a "war crime," was fired. “Until Russia entered the action, my commentaries were allowed on air, but as soon as Russian tanks went to aid Ossetians everyone started repeating the same words about Russia’s aggression…. After I tried to remind [everyone] who started the aggression while live on air, I was lectured by a superior via the phone,” he added. Bater also had his assignment to Tskhinval revoked. The journalist, who has significant international experience covering conflicts, had worked hard to obtain permission for a trip to Tskhinval. “I made a report based on footage made by our operator in South Ossetia, but it wasn’t aired,” Bater recalled. The report is available in Russian on the Izvestia website, though it contains little that is unknown for regular RT viewers. Following the controversy over his reports, Bater was removed from covering conflicts in Caucasus amid claims that he is a "Russian spy" and has a bias in those conflicts because his wife is Abkhazian. In a separate incident, the German weekly Der Spiegel cancelled its own plans to publish photos from Tskhinval by Pavel Kassin. Spiegel first ordered some 29 shots from Kassin, which were sent to Spiegel’s Hamburg offices in due course. However, none of them appeared in the subsequent issue of the weekly. Spiegel went for photographs done on the Georgian side of the front line. Keeping in mind the spirit in which Western media covered the Georgian-South Ossetian conflict, there is hardly any surprise that the process of international recognition of the newly independent republics has stalled. After Russia recognized the independence of Abkhazia and South Ossetia in late August, Nicaragua followed suit in September and up until now remains the only country to have done so. Somalia declared an intention to recognize the two breakaway republics in October. As Somalia’s ambassador to Russia, Mohammed Khandule, declared, his government fully supported the right of both republics to self-determination. However, no further moves were made by Somalia since. Another country that had mixed ideas regarding the recognition was Belarus. Initially President Aleksandr Lukashenko vowed to initiate a discussion on recognizing the independence of South Ossetia and Abkhazia in Parliament back in 2008. But later after receiving tempting offers from the EU, he postponed the move indefinitely.